← Climate Skepticism and Schools? More than three years ago, I posted a blog called, “What Do I Think of the World Bank Data? What Do You Think?” I showed the 41 indicators that the World Bank lists under its climate change category. I then asked my students to write in the comments section about why these indicators belong in this grouping. I am still doing this with new students. You can go there and try the exercise for yourself. Meta-research is a recent field of research that studies research practices with the aim of finding evidence-based improvements. It is also known as “research on research” or “the science of science” as it uses research methods to study how research is done and where improvements can be made. It covers all fields of scientific research (including health and medical research) and has been described as “taking a bird’s eye view of science”. It aims to improve scientific practice as summed up by John Ioannidis, “Science is the best thing that has happened to human beings […] but we can do it better”. A systematic review of observed impacts was conducted by creating a table in which ten climate hazards (warming, precipitation, floods, drought, heatwaves, fires, sea level, storms, changes in natural land cover and ocean chemistry) were listed in columns and six aspects of human systems (health, food, water, infrastructure, economy and security) were listed in rows (see Methods). This table was used as a guide for all possible combinations of keywords to search for publications reporting the impacts of climate hazards on key aspects of human life. From over 12,000 references assessed, we identified 3,280 relevant papers that were read in full to find case examples of climate hazards impacting human systems. Our criteria for the selection of impacts required that impacts be observed and supported with traceable evidence (that is, there was a reference to a place and time that could be traced to where and when a given impact occurred). Impacts were subcategorized within each of the six primary aspects of human life to reflect the variety of documented impacts (for example, death, disease within human health; see Fig. 1 and Methods). In total, we found case examples for 89 attributes of human health, food, water, infrastructure, economy and security impacted by the ten climate hazards. 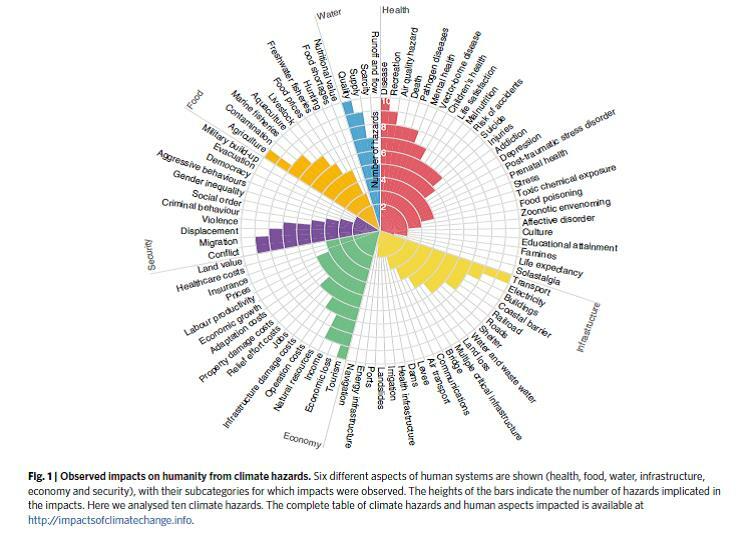 Of 890 possible combinations (10 climate hazards × 89 attributes of human life), we found case examples for 467 interactions or pathways by which humanity has been impacted by climate hazards. For brevity, pathways are described and supported with at least one case example; however, very commonly we found numerous similar case examples of impacts, which are listed with their associated paper in a publicly available online database (http://impactsofclimatechange.info). This list is intended to document the vulnerability of human systems to changes in climate hazards. The researchers identified 10 climate hazards: warming, precipitation, floods, droughts, heat waves, fires, sea level rise, storms, changes in natural land cover (choice of land for specified activity), and ocean chemistry (acidification). They also found 89 impacts on humans, which fall into 6 categories: health impacts (27), food impacts (10), water impacts (4), infrastructure impacts (21), security impacts (11), and economic impacts (16). It gave them a total of 890 entries (many of them empty). Figure 1 summarizes the entries, but it is hardly readable even in the original paper. The authors also provide a supplemental site that shows the climate hazards as columns in an interactive table with 89 rows. Many of the cells include citations of the original references and a short explanation of the connection between the hazards and the impacts. In most cases, the references provide a quantitative assessment of the magnitude of the correlation. On Friday, the US government issued a new report (more than 1600 pages) that covers the same basic topics as the Mora paper. The two main conclusions are also the same: climate change is happening now and the impacts affect every aspect of our lives. Business as usual scenarios guarantee that those impacts will continue to compound (think of the two main fires currently raging in California). The reports are coming out at a much faster rate than any one of us can digest – certainly infinitely faster than we are taking steps to mitigate or adjust to climate change. The sad part is that this is an official US government report and yet the president made a comment that the unusual freezing cold weather on Thanksgiving was evidence that climate change is a hoax. Science can be intimidating and confusing to some, especially when they’re not always in the know about methodology. Hopefully continued meta-research will help ease anti-science sentiments and let us move forward. This entry was posted in administration, Anthropocene, Anthropogenic, Climate Change, Extreme Weather, Sustainability and tagged acidification, Adaptation, Anthropocene, Anthropogenic, Clean Energy, Climate Change, Climate Change Denial, Climate Change Deniers, climate hazard, Climate Skeptics, Donald Trump, Drought, Economy, Emissions, Energy, energy transition, Environment, Extreme Weather, extreme weather event, fires, floods, Food, Fossil Fuels, Future, Global Warming, hazard, Health, heatwaves, impact, indicator, Infrastructure, meta, meta research, Mitigation, ocean acidification, ocean chemistry, Precipitation, Research, Science, sea level, security, Storms, Sustainability, Trump, warming, Water, Weather, World Bank. Bookmark the permalink.